This is an excerpt from an interview published in the Spring 2009 issue of The Carousel. Richard Washer is a workshop leader at The Writer’s Center and company dramaturge for Charter Theatre. 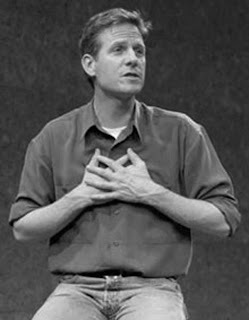 Martin Moran, author and Obie Award-winning actor, will perform part of his one-man show, The Tricky Part: A Boy’s Story of Sexual Trespass, a Man’s Journey to Forgiveness on Monday, October 19 at 7:30pm at the Center. Martin Moran grew up in Denver and attended Stanford University and The American Conservatory Theater in San Francisco. He lives in New York City where he works as an actor and a writer. He has appeared in many Broadway and Off Broadway plays including Titanic, Cabaret, Bells Are Ringing and Floyd Collins. He was awarded a 2001 Fellowship for Creative Non-Fiction from the New York Foundation of the Arts. He won a 2004 Obie Award for his one-man play, The Tricky Part, which New York Times theater critic Ben Brantley praised for the quiet victory of "rendering chaos with this kind of clarity." Moran continues to perform The Tricky Part all over the country. Read more online at the book's website here. Which came first, the writing or the acting, and what are your earliest recollections of having a passion for that particular form of expression? When I was boy, I remember harboring a quiet notion that I’d be a writer. I’m not sure if it arose from seeing my Dad’s byline (he wrote for The Rocky Mountain News) or because I just loved books. But the first passion that truly gripped me was the stage and that happened sophomore year of high school when I landed, by what felt like total chance, in a musical, A Funny Thing Happened On The Way To The Forum. I played ‘Hero’ and the instant I stepped on stage, a bundle of nerves wrapped in a toga, I was intoxicated by the attention and by this event called Theater, this vivid experience of human connection. I was hooked, as they say. Theater saved me and, as it turned out, has given me a life. Writing came much later, in my early thirties. It came with an imperative to tell a certain life story. I am interested in the intersection of the processes you engage in both as writer and actor. How does the craft of acting inform your writing or the craft of writing inform your acting? Both crafts require a kind of hunger to inhabit, to illuminate, human beings and human experience. Both crafts share, I think, the exercise of compassion. And the practice of one helps me grow more transparent and confident, I hope, in the practice of the other. The Turkish writer, Orhan Pamuk, once said: “…a writer must have the artistry to tell his own stories as if they were other people’s stories, and to tell other people’s stories as if they were his own, for that is what literature is.” To imagine and/or enter into another’s story, (their) being, even as you enter deeper into your own, this is the gift, the challenge of crafting a narrative or playing a character. I had a friend who used to say regarding the creation of a character: If you can walk him, you can talk him. The desire to communicate, to offer to others a human story—as writer or actor—is fueled by love, I think: an ache to uncover our common plight and joy, to shorten the distance between ourselves. What draws me to both pursuits, I believe, and where they intersect, is a devotion to the portrayal of complexity. We can so easily fall into a black and white, Us versus Them, a “you’re-either-with-us-or-against-us” view of the world. This objectifies human beings, allows us to bomb, to violate, because people become things, inconveniences. Both writing and acting are a way of recalling, exchanging, and raising consciousness. Can you name some influences on your work (either in writing or acting) and how they have impacted your work? My earliest influences came with music (my high school voice teacher) and movement and so I was most drawn to a kind of physical and musical form of story telling. In my twenties, I worked with theater makers like Meredith Monk and Anne Bogart and studied for a time with the French Director Ariane Mnouchkine. I was a dancer and always found movement the thrilling aspect that made theater distinct from work on the screen. And, of course, my love of Broadway musicals influenced much of the direction of my career. I began to turn my ear and my heart more intensely toward literature. The narrative poets Stanley Kunitz, Akhmatova, playwrights, Brecht and Miller and so many others began to teach me about the power of words and of concision, the force of narrative and of myth. As I began to write for the stage, Spalding Gray’s worked influenced me a great deal. You have adapted work for the stage (from your own book). Can you identify one joy and one challenge associated with adaptation? One joy and challenge was learning how grappling with one form nourished the other. The imperative I felt to make the play intensely engaging helped me ultimately find the narrative structure of the book. And the desire to make the words on the page as clean and vibrant as possible helped me find the lucidity of the play. A big challenge, especially with the play, was deciding what parts of the story belonged in and what out. At every turn I needed to cut and find what was revealed by what was omitted. The big challenge when approaching the play was always the question: “What makes this an event in the room, alive in the moment?” This is a very different question from what keeps the story true and engaging to a reader sitting alone in a chair. The intimacy of a single reader is different from the communal experience of the theater. What’s next for you professionally? Gee, I don’t really know. I sort of wake each day attempting to cultivate faith in what is and what may come. I am at work on a collection of essays about my experiences working with refugees seeking asylum here in the US. I am auditioning for the odd acting job here and there. I was invited to write a piece for Ploughshares’ fall issue and am agonizing over it. I just played a small part in a TV pilot for a Showtime series called “Possible Side Effects.” I have no idea if it will get picked up and go on. It’s all a mystery.